Have An Awesome Holiday & Even Better New Year in 2014! I hope all of the photo buffs that tune into PhotosThatInspireWords.wordpress.com never know money worries again, get good and stable jobs, have a great place to live they can afford, work less and enjoy more, have a sphere of supportive, positive people around them and keep seeing life through the eye of a Nikon camera. Those are my wishes and I also want the best for all of you too! 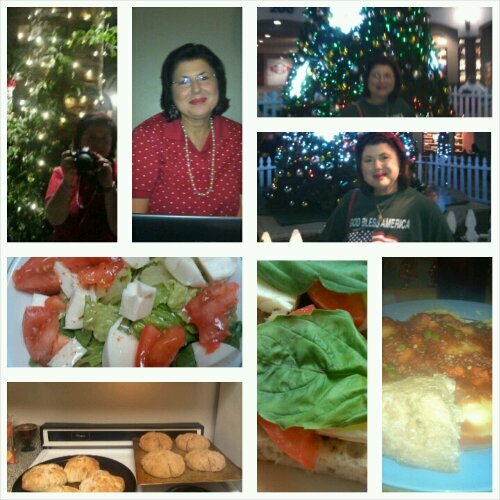 The photos of me were taken by Nick F. Belman in and around the Huntington Beach Pier area and promenade, and the food photos were taken by me- Paulette Le Pore Motzko. The recipes for the dishes you see: Snow Flake Breads I baked and gave to my friends & just to cheer sad people up…and Caprese Sandwich on Focaccia Bread are found on CookingUpaStormWithMissPolly.wordpress.com. I am buying my domains soon on WordPRESS so my content I create remains mine.